First severe sneezing lasts for about 1 – 2 days. Next there is conjunctivitis. Ths is called “pink eye”. The eyes are pink. There is also runny nose and the eyes water too. 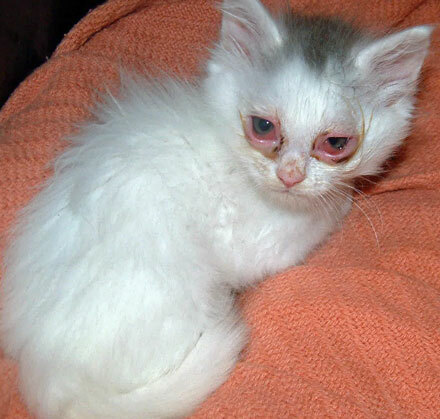 Days 3 – 5 and the cat may have a fever and be apathetic and lose his or her appetite. How to check a cat’s temperature. The watery discharge from the eyes and nose may become a mucous like discharge. The cat might breath with mouth open. The eyes might be inflammed. There may be a cough combined with sneezing. Further signs are (for upper respiratory infection caused by calicivirus) ulcers in mouth, drooling and shortness of breath, dehydration (lack of skin elasticity), starvation. 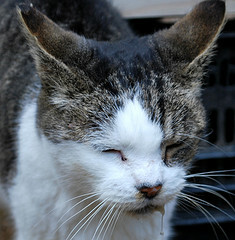 This entry was posted in Cat Health and tagged cat health problems, Diagnosing Respiratory Infections by Michael Broad. Bookmark the permalink.